Rambling Rican: Please post questions for Luci Romberg! I was very fortunate to get Luci Romberg to let me blog about her :) Just like I did with Michael Milner (from Sasuke 20) I'm going to be doing a blog entry on Luci! 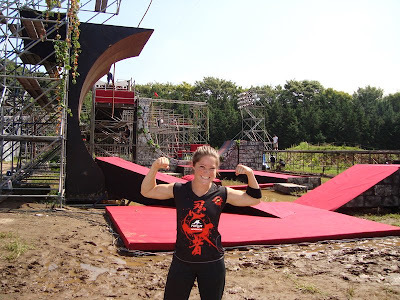 For those who remember who she is - she is one of the winners of American Ninja Challenge (or ANC) 4. (co winner with Mark Witmer and Brian Orosco). For the record I'm only doing Sasuke 21 (Yes she is competing in Sasuke 22 but is under NDA until it airs in G4 - sometime in June.. I think.. coming soooon™...) so don't ask any questions regarding that. I'm posting this here and on both the G4 boards and Proboards. For this blog just use the comments section at the end of this entry. With Sasuke 22 showing this Monday I'll only keep the questions open for a short time. I figured since everyone will be checking the site for Sasuke/Ninja Warrior stuff I might get a lot of responses really fast. I won't get this blog up though until AFTER I'm done blogging about Sasuke 22. Considering the last time.. it might be another couple weeks until I get it done. Guidelines - please don't get too personal. Keep questions to Sasuke/Ninja Warrior 21 only! I also have the right to not include all the questions and she also reserves the right to not answer all the questions :P Also - please keep this thread to questions only. Once the blog is done I'll create another thread with the answers and of course the blog entry. Friend of hers from Tempest (free running team) were all doing entries for Ninja Warrior. At the time she did not know what it was or how it worked and had no idea she would be competing against the guys. Once she realized she won was did her best not to disappoint the fan base and everyone has been really really supportive. Late/August early/September was a long month for her. She did the free running championships in London then went to Sasuke directly from there. She met everyone going (ANC guys) at the airport in Japan since she was coming from London. She was extremely excited to be at Sasuke and she can't describe the giddiness being there and meeting the All-Stars. She did her best but disappointed about the half pipe and she knows what she did wrong (insert Nagano advice :) Yay!). Oh! P.S. If you wrote a question in the G4 boards or Proboards you don't have to duplicate it here.. and vice versa I'm monitoring both boards. Gah P.S. #2 - Feel free to say "From (insert name) from (insert location)" if you want. You don't have to .. I'll end up writing your screen name and what board/blog it came from if you want. AND one final thing - I've been asked this alot.. which do you use to see this? My vote still goes for TVAnts - the less people on KeyHole the less likely either will crash. For those coming in late.. Live Station no longer airs TBS. We expect several hundred people all watching this simultaneously. TVAnts seems to work under load (it did for 3 minutes) and the picture is actually really good.